Multiple stakes winner Scoopies Leaving You is one of 10 sprinters entered in Friday’s 250-yard, $20,000 Delta Dash Stakes at Delta Downs. VINTON, LA—APRIL 16, 2018—Joel Galindo’s Scoopies Leaving You, a multiple stakes winning 7-year-old son of Coronas Leaving You, is one of 10 sprinters entered in Friday’s 250-yard, $20,000 Delta Dash Stakes at Delta Downs. Trained by Kevin Broussard, Scoopies Leaving You is coming off of a Louisiana Downs winter campaign during which the stallion scored a neck victory as the 5-2 favorite in the 250-yard, $15,000 Harrah’s Dash Stakes on January 6. Scoopies Leaving You drew post 2 and will be ridden by Donald Watson for trainer Kevin Broussard. Other Delta Dash contenders include DM La Jolla, a 4-year-old gelded son of Hiclass La Jolla trained by Porfirio Fierro for owner Horses of Fire Inc. DM La Jolla will be making his season debut and his first start since November 4, when he ran second, a neck behind winner RC Me Leaving You, in the 400-yard, $25,000 B.F. Phillips Jr. Handicap (R) for Texas-breds at Lone Star Park. 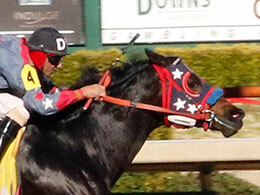 DM La Jolla drew post 3 and will be ridden by Rolando Cabrera. Also on Friday, 46 3-year-olds have been entered in five 350-yard Old South Derby trials. Grade 2 winner Sixes Flash, a Streakin Sixes colt trained by Barbara Alcantara for owner Rancho Herradura LLC, drew the rail post and will be ridden by Rolando Cabrera in the first heat. Sixes Flash has earned $155,025 from 11 outs, and his two wins include a neck victory at odds of 13-1 in the 350-yard, $274,000 Firecracker Futurity (G2) at Delta Downs. The 10 fastest qualifiers from Friday’s trials will meet in the May 11 , $25,000-added Old South Derby final. All Delta Downs races can be seen at Q-RacingVideo.com.